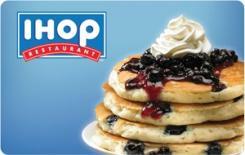 Earn 5.4 SB per $ when you buy IHOP gift cards at MyGiftCardsPlus, powered by Swagbucks. Some of the best memories are made at the breakfast table. For more than 55 years, at more than 1,600 locations, millions of people have made those memories at IHOP®. Fluffy pancakes, omelettes layered with flavor, the iconic Rooty Tooty Fresh N’ Fruity®, and more than 30 Simple and Fit items all under 600 calories, nobody does breakfast better than IHOP. With IHOP gift cards, you can start the day off right. Whatever the occasion, wherever you are, create a memory with an IHOP gift card. Always easy to order, IHOP gift cards are convenient, flexible and available in either plastic or digital formats. Plus, there are no fees or expiration dates. So treat yourself and make a great memory at IHOP. Visit http://www.ihop.com to learn more.